This is any dance that is native to a region or ethnicity. There are folkloric dances of Gypsies, Middle Eastern Countries in Africa, Hawaaii, Spain and many other countries. Some belly dance moves have origins from these regions and many more. Many belly dance moves have roots in the Middle East and Africa, but breakdance and hip hop do as well. It’s just that what one culture calls Twerking, another calls the Suhaila technique. Of course the posture, costuming and intent also differ. If this is a topic that interests you, consider reading the upcoming post on: What is the Difference Between the Suhaila Technique and Twerking? The roots of early belly dance in America was based on Middle Eastern and Romani (Gypsy) dance moves and music and was considered quite risque by the Victorians. Some called it the Hoochie Coochie which grew into it’s own form of dance. 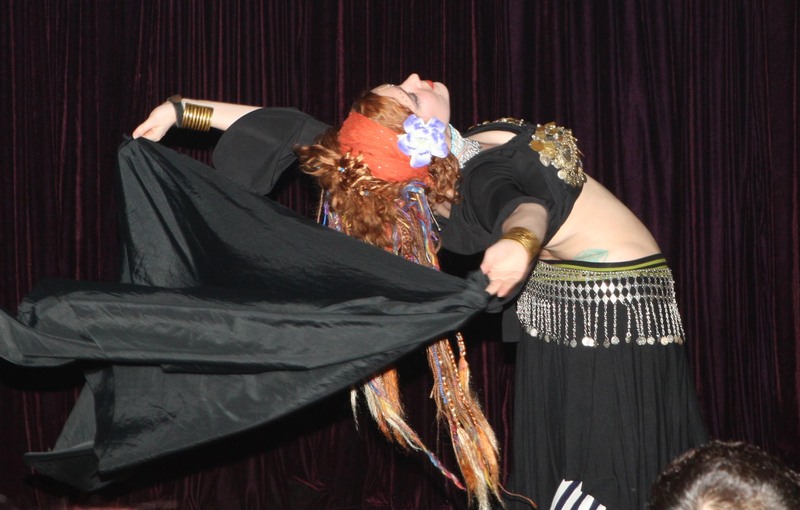 Belly dance was first performed in burlesque shows, nightclubs and travelling circuses. When one imagines the sequins, beads and fringe of the costumes of the 1920s and 1930s when belly dance was becoming more popularly performed in nightclubs, it isn’t hard to see how the era influenced the costuming. Cabaret was a nightclub style dance that became an art form. It grew and changed, going back to folkloric roots in the American Tribal Style and then changing again as it grew to encompass a fusion of many nontraditional and modern styles of dance in tribal fusion. Just like the movie, Cabaret, think of glittering costumes with beads, sequins and fringe in a nightclub setting—with belly dance music. This style came to America in the 1800’s but grew to become more popular in the 1930’s with the increase of more Middle Eastern immigrants dancing in nightclubs, circuses and burlesque shows. Is it really suprising beads and fringe would become the staple after becoming popular in that era? What we think of as cabaret style belly dance is often based on moves from Turkish, Romani (Gypsy) and Egyptian bellydance. This “fusion” is sometimes called American Oriental though some practice a style from one region such as Turkish. The music may be traditional or modern Middle Eastern music, though in many regions dancers can still dance with a cabaret style costume using belly dance moves to a non-traditional song like an American pop song and still be considered a cabaret belly dancer. This is a specific form of belly dance invented in America based on folkloric moves, costuming and music from the Middle East, Africa, India and other countries. Some sources say it began in the 1960’s with Jamila Salimpour’s teaching and performing of folk dance in her belly dance, other sources credit Jamila Salimpour’s student, Masha Archer, while others credit Masha Archer’s student Carolena Nerriccio. The later created the name and common language of dance in that style, enabling troupes to perform improvisation dance. The moves are a “fusion” of ethnic dances, music and costuming but it is an American invention in origin to combine them in that way. Tribal Fusion is the most modern American invention in the belly dance community.Although credited to Jill Parker and Ultra Gypsy, the style has been popularized by Rachel Brice and her distinct style. The idea is to not only combine American Tribal Style with Cabaret, but also with other styles the artist chooses. These may include other folkloric dances, hip hop, breakdance, jazz, burlesque, fire dancing or hooping. The costumes can range from a mixture of any of these styles. Some consider themselves Gothic (imagine lots of black) or tribaret (a combination of tribal and cabaret), however these are sub genres within the tribal fusion community. Although Fusion is often used to refer to modern belly dance that combines belly dance with non-ethnic dance, if one understand the history of bellydance in America, one is more likely to accept that all belly dance is fusion. However, for those who aren’t belly dance philosophers, it is easier to call the most modern style something since everything needs a name. Personally, I consider myself to be a steamfunk fusion belly dancer, but that’s only when I’m not an alien slave dancer for Trek Theatre.